Hey guys! 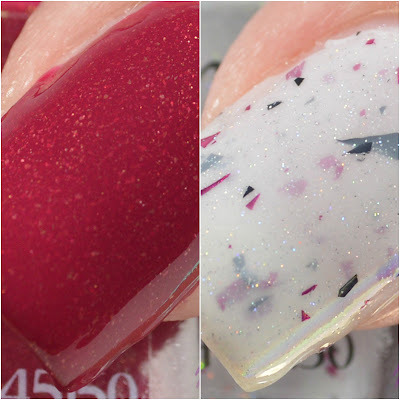 Top Shelf Lacquer recently released a stunning 9 piece collection for Valentine's Day. It includes a variety of cremes, holos, crelly, and microglitters. I picked my two favorites to share with you guys today. Cranberry Cider is a scarlet red creme with gold glitter. Formula and application were flawless. This is 2 coats with top coat. Pink Cadillac Margarita is a white crelly with metallic hot pink and black shreds and a touch of scattered holo throughout. STUNNING!! I wore this for 5 days with no chips or tip wear. This is 2 coats plus top coat. If you want to pick these up for yourself, you can do so HERE. Minis are $7.25, full size are $9.50. Do you have anything fun planned for Valentine's Day?